Make art every day. No excuses. Even if it’s a sketch on a napkin at a restaurant with a terrible quality crayon. Do SOMETHING. Those few moments a day are sure to improve your skills over the course of the year. Sharing is encouraged! Please use #dailyATCs I’ll post and link as many folk’s ATCs here as I can. An ATC measures 2.5 inches by 3.5 inches. If you do your work this size, you can find wonderful display cases and it makes actually trading your work easier. Any media. Use what speaks to you for the day. Prompts will be posted here daily. I made two for today. 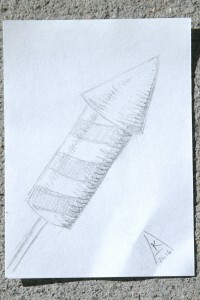 One took under 5 minutes and is a sketch done on some scrap paper using a 0.5mm no.2 lead mechanical pencil, the exact kind I’d use on math homework or sketching woodworking plans. It may not be anything fancy, but it was a good chance to practice sketching and shading some relatively simple geometric shapes. It might not be something I want to hang on the wall, but it served the purpose, I learned from it, I got good practice in, and instead of making excuses, I made some art! The second one took probably about 30 minutes not including the dog walk I went on with Kaizie while waiting for it to dry between watercolor and ink applications. I used some terrible watercolor paper which I assume is hot press. I’ve had the paper pad since my age was in the single digits and I believe it came in one of those 100 piece art boxes for kids. I used some cheap PRANG watercolors I’ve had since I was a kid as well. I despise Crayola watercolors, but the PRANG semi-moist watercolors are pretty decent for the price. 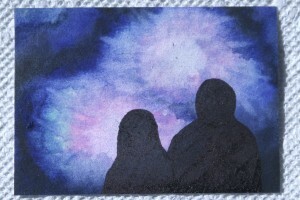 After the very wet sky with fireworks had dried, I used a Faber-Castell Multimark M ink marker to add the silhouettes of the couple watching the fireworks show. I’m incredibly happy with how this ATC came out. I’ve never done anything like it before and I’m definitely feeling inspired to try some more night sky and galaxy sorts of watercolor paintings. Neither ATC is anything too fancy, but I sat down and I made them. I already feel like I’ve made improvements given how far outside my box I stepped to do the watercolor and ink picture of a couple watching a fireworks show. It’s time to go get on with the rest of the day here, errands, cleaning, and probably a bit of work on a crochet pattern I’m typing up, but after spending a few moments creating art this morning, I feel much more ready to take on the day and tremendously satisfied that I made something beautiful! I think I may need to pick up a scrapbook to hold the year’s ATCs so I can flip through the progress this time next year. For Christmas I received a sketchbook with 500 drawing prompts. I love it and am working my way through it. As cool of an idea as this book is, it falls a bit short of what I want for daily artistic practice and inspiration. I feel constrained by the variable size spaces given to each prompt. I struggle working effectively with the spine in the way. I’ve only done two drawings in the book and already I’ve torn the first two pages away from the binding along the top of the spine. The prompts are on both sides of the pages too so the graphite transfers between drawings. Since the paper is thin, you can also see the drawings through one another a bit. I can only imagine how much worse it would be if I were using ink! The paper is not suitable for any wet media. I definitely need to work on my pencil drawings, but there really isn’t much in the way of media options for this book. So that got me thinking, why can’t I do something better? 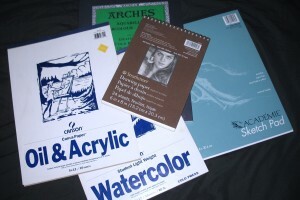 And couldn’t it be free for everyone instead of requiring a specific sketchbook? Of course! For Inktober 2015, I used artist trading card size sheets of paper cut from some leftover cardstock I had. I loved working with that size sheet. It’s not too intimidating, and if I wrecked a page, oh well! It’s not like I’m throwing away good art supplies nor spending too much of my day laboring over a picture I’m just not really feeling, you know? So that’s what I’ll do. Instead of just a month of ink sketches as for Inktober, I’m going to do a whole year of prompts. I’ll use ATC size sheets of whatever sort of paper or board is most appropriate to the media I want to use that day. There’s super heavy oil & acrylic canva-paper or just plain printer paper. There’s textured papers for charcoal and pastels and glossy smooth papers for markers. Any paper, any media in an ATC-sized piece of artwork. The goal will be just to make a little bit of art every day for a year. To step outside our comfort zones. To practice our skills. To learn new ones. To stop hiding behind excuses and let loose the artist we all have inside, even if just for as little as 5 minutes a day. Stay tuned for the details tomorrow morning as we start a year of art! Each day will include a prompt to get you started thinking about what to do and a sample or two from Maple Wool Farm.